Design for stained glass in St. Vitus Cathedral, Prague, by Alphonse Mucha, ca. 1930. 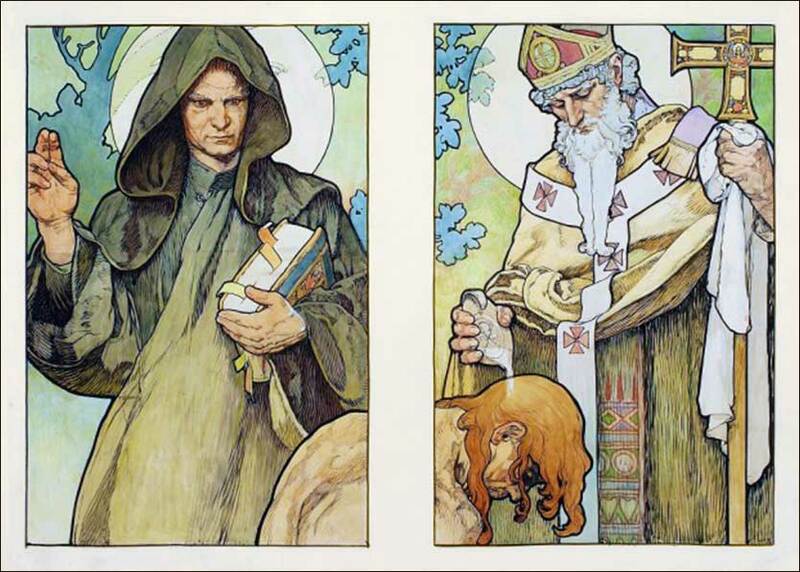 Mucha, a master of Art Nouveau, depicts Cyril and Methodius, missionaries to the Slavs in the 9th century, baptizing a convert. 227 people in our community are currently praying with you. I...I will lift it for you. I...I will break it for you. I...I will be there to find you. I...I will shine to guide you. Music and lyrics by Tawgs Salter. 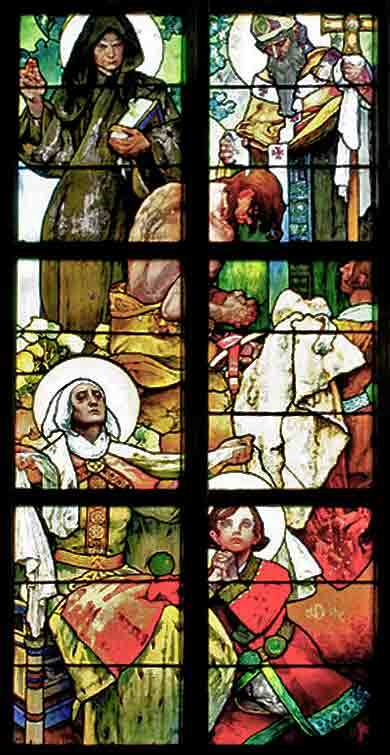 The full panel of the stained glass window made from the top photo (Alphonse Mucha, St. Vitus Cathedral ca. 1931). At the bottom are King Wenceslas as a youth, and his mother. The righteous will be remembered forever. and will finally look with satisfaction on his adversaries. His name will be exalted in honor. The wicked will see it and be vexed. The desires of the wicked will perish. Those who have read the New Testament closely will understand how the law of Moses applies to Christians. For those who are at an earlier stage of study, here is one quick way to summarize it in modern legal terms: Christians are no longer obligated to follow the letter of the law, but they are obligated to look to it and to follow the spirit of the law. Difficult questions arise in the case of benefits promised under the Old Testament, and today's beautiful passage from Psalms raises one of them. Consider the verse: “[T]he generation of the upright will be blessed. Wealth and riches will be in his house: . . .” God promised the Jews material benefits for following the law. There are even churches that teach the ludicrous doctrine called “prosperity theology”: that if you follow Christ, you will get rich. They motivate congregations to follow Christ so that, basically, they can make more money. Well, we know that “pray and get rich quick” was not Christ's message. But even more honest and Biblical Christians find a tension between wealth and piety; for at no point does the Bible teach us that poverty, or at least the minimal living standards adopted by Jesus and the apostles, is an absolute prerequisite for a full share of Christ's blessing. What we must avoid is rationalization. That is, convincing ourselves that our greed is Christian, by stubbornly clinging to a line of thought that conveniently makes the Bible say what we want it to say about wealth, rather than what it actually says. Perhaps God will bless us with a lot of money in this life. Perhaps we will make less money, due to our faith, because there are things we will not do to make money that others will do. We may certainly enjoy the good earth and its benefits. Thankfully, there is no tension between the other promises made in Psalm 112 and the teaching of Christ and the apostles. Without doubt, a light rises up to us in the darkness, that will take away our anxiety; we can live without fear of evil tidings, our hearts buoyed up by the Holy Spirit, any time, any place: all we need to do is ask, and the peace “that passes all understanding” is ours. So, if we are vexed by an issue having to do with money and religion, we need simply pray for peace about it. The Holy Spirit will show us the way, and, whatever decisions we make, we can find inner peace about them.